Leaving Brisbane River behind us as we sped to Tangalooma! Some picture perfect winter weather and an incredible array of wildlife made this one of the best day trips I have ever done. Even the boat trip over to Tangalooma on Moreton Island was incredible, we spotted rare river dolphins before we even left the Brisbane River! During one August, my sister was visiting from New Zealand and we wanted to do something special to celebrate my birthday. She is a marine biologist, I knew it had to be on or in water! We only had one day to do something, so a day trip to Tangalooma, was the perfect choice! The trip on the boat takes about an hour and half. It isn't that far, but they have to abide by the speed limits in the Brisbane River. The ferry terminal at Holt Street Wharf is close to Brisbane Airport at Pinkemba and quite far up the river. 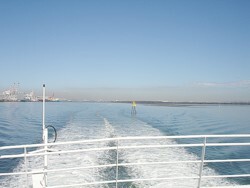 As soon as you get out to Moreton Bay, the motors rev up and off you go. We stayed on deck, so we could see as much as we could, and also because neither of us are very good on boats! We did go prepared with our ginger tablets, salty chips and water to drink! We really didn't need to on the day we went. You can see from the photos that it was really calm. The boat trip really pleasant and not at all choppy. But I have seen it whip up a bit in the bay, so I guess we were lucky. As we got closer to Moreton Island we started to get excited as we could see the incredibly white sand. Moreton Island is apparently the 3rd largest sand island in the world. The water clarity and colour was breathtaking. Unfortunately, I don't think I was able to capture that fully with my photos. 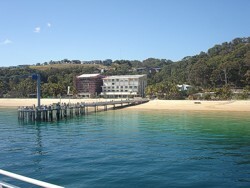 Our first view of Tangalooma resort was the apartments by the jetty and the beachfront. at Tangalooma for our day trip. ...and I was beginning to wish that we had! We were both awestruck with the sheer beauty of this secret island paradise! And looking back across Moreton bay we could see Brisbane and telt just a little bit sorry for everyone else who was in those office blocks we could see working on this amazing day! I wished we had packed our swimmers, snorkels and towels! 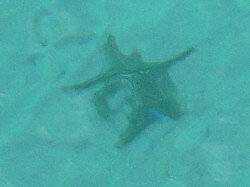 Moreton Bay Starfish in the incredible blue waters. We had booked ahead to include an optional tour called the Dugong Eco Tour. It isn't available everyday, and if the weather isn't good it doesn't go out. We were so lucky with the weather and the tour. We saw turtles, flying fish, starfish, dolphins and of course dugongs galore. Unfortunately, dugongs aren't photogenic unless you are under the water with them! From above dugongs (sea cows or manatees) just look like big brown logs lumbering along in the water and only come up for a quick puff of air. Tangalooma is on the western side of Moreton Island. About half way up, about in line with Redcliffe in Brisbane's northern suburbs. 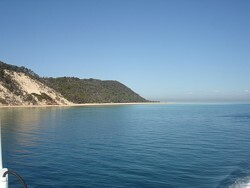 Moreton Island, is the third largest sand island in the world. Tangalooma was originally a shore based whaling station which was open for 10 years and closed 1962. Just north of the resort are the Tangalooma Wrecks. They are great for snorkelling or SCUBA diving. Visitors can take a Tangalooma day trip, or stay longer. Words cannot describe the feeling of seeing them though. We saw a herd of around 20 and we hung with them for ages. It was priceless, and my sister, she was almost speechless! Other visitors on the Tangalooma day trip who didn't go on the extra tour with us got to try out some of the other activities like sand tobogganning, parasailing, jet skiing. I think a few even braved the water for a snorkel on the Tangalooma Wrecks. For a day trip, there is plenty to do and the resort was being upgraded when we were there with extra apartments and other facilities being built. 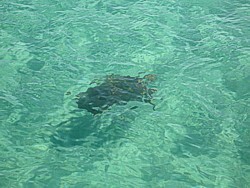 This was my first ever turtle spotting! this photo but it was almost a metre long! Don't you love that water! I spent the whole day feeling guilty about being there without my family! It is definitely somewhere you will want to share! When we got back from our Dugong Eco Tour, we had some time for a bit more of an exploration of the resort. We saw the relics of the old whaling station, walked along the beach towards the Tangalooma Wrecks, checked out the Tangalooma Villas as somewhere to stay on a return visit and enjoyed watching the sun starting to set over the water. I recommend you book your Tangalooma day trip ahead of time because it gets very busy during peak holiday times especially Queensland School Holidays. I suggest you book this sort of trip early in your holiday, as weather can cause boat trips to be cancelled and this gives you the best chance to reschedule. Always check the terms and conditions when you book any tour. You may be able to change the dates, subject to availability if things change. Please do check that, don't take my word for it, as these things have a habit of changing! Some tours only go on certain days, but when you book it will be obvious, even online! 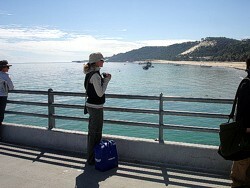 Being a local, for our Tangalooma day trip, I saved a bit of money by driving to the ferry terminal. If I was on holiday in the Gold Coast, I would probably have paid the extra to be picked up from my Gold Coast hotel for a fantastic day trip to Tangalooma! When you are on holiday in a location you don't know well, then the extra cost would easily have outweighed the stress and worry driving to the ferry terminal in Brisbane, trying to find the right place, be on time, negotiate toll roads and fighting with Brisbane peak hour commuter traffic! over the water, just before we left. If you are a family on a budget, it may be worth considering hiring a car and then taking a Tangalooma tour with a Brisbane departure. Just make sure you know where you are going to meet the tour and leave plenty of time. The tour we went on left at 10am from the ferry terminal and left Tangalooma about 4pm. We were back in the Gold Coast comfortably by 7pm, though if you come back with the tour you may be a little later getting back to your Gold Coast hotel. We didn't get to see the wild dolphin feeding, there are some tours where you stay back on the island to do that and catch the later ferry. So that would get you back to your Gold Coast hotel quite a bit later. Check out the different options for Tangalooma day tours, ferries, Moreton Bay cruises and transfers. 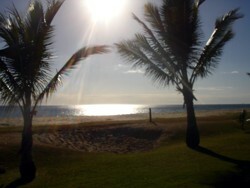 Here is a list of things to take with you on your Tangalooma day trip. Some are optional, others are a must! Sun protection - hat, shirt, sunscreen and sunglasses. These are a must all year round. Warm clothes just in case the wind whips up and in winter it can be cooler. Camera - still and video. And don't forget the instruction booklet if you are not sure how to use them! Sea sickness remedy - if you need one. Or else stay on deck! Whale Watching is also available from Tangalooma with the whale watching trips taking in Moreton Bay and out into the ocean depending on where the whales are. There are options to combine a trip to Tangalooma with whale watching during the whale watching season which runs from June to late October each year.